If you want to enable people to train on your distributed product, they’ll need an integrated training platform with distributed, on-demand labs. That’s what we built City Cloud Academy. A fully integrated platform enabling you to run realistic, distributed live lab environments on OpenStack, all running on the Open edX stack. Whitestack is the leading training provider for Cloud, SDN, and NFV in Latin America. Our Cloud training track is comprised of introductory (conceptual) courses and technical courses. As a key differentiator for Latin America, Whitestack is the only company that offer Openstack Training in Spanish and Portuguese. Whitestack holds a number of OpenStack Certified Engineers in Latin America, in order to provide the right expertise to Corporations, Datacenters or Carriers. The Linux Foundation's training program offers up-to-date Linux courses that are distribution-flexible, direct from the source, technically advanced, and customizable. When working with technology you are either learning... or you are being left behind. Our courses provide you with up-to-date, relevant, hands-on experience with current Cloud technology and software. Take an on-demand course - set your own learning schedule. Try Intro Cloud Applications on OpenStack for FREE! This course combines both hands on and lecture, allowing students to learn OpenStack architecture and operation. Students will examine both front end and back end OpenStack components, revealing the actual OpenStack function at the component level. In addition to a technical review of the architecture, this course teaches practical skills, as you will perform hands on labs to administer an OpenStack datacenter and set up, network, create and delete virtual machines and services. You will learn important DEVOPs skills that illustrate how to fully administer the software defined infrastructure made possible by OpenStack. Important linux skills necessary to perform effective CLI tasks are also taught. All hands-on labs are written to reinforce each lesson, making the concepts clearly understood. The Linux Academy partners with a number of organizations to provide verified certification preparation courses that showcase our expertise in those knowledge domains while remaining focused on what our user community needs and asks for. The evolution of cloud technologies is happening faster every day. Let us help you take advantage of the cloud (r)evolution and accelerate your business through trainings customized for your requirements. The Rackspace Training for OpenStack program is a multi-course curriculum which offers classes ranging from an introduction to OpenStack to building cloudy apps and is designed to expand worldwide adoption of OpenStack technology. AWcloud OpenStack training program offers hands-on and task-focused courses to give real-world skills that IT teams need to manage their clouds. This program is backed by our senior engineers who actually implement OpenStack for enterprise customers. Virtualiza desde Zero es la referencia Española en formación Openstack para profesionales. Elevamos la formación a otro nivel llevándote de la mano para adquirir los conocimientos necesarios y ser un Administrador Openstack Certificado" Openstack desde Zero. A trusted training partner to leading services providers worldwide, Award Solutions offers OpenStack training with a clear focus on SDN and NFV. Those attending our workshops benefit from experiencing OpenStack as integrates with both legacy wireless and virtual networks. Award offers a suite of courses in virtualization technologies. Enable yourself to plan, manage, and troubleshoot virtual networks, and learn why 98% of those attending our courses recommend our training to others. Whether you prefer classroom learning with an experienced instructor to answer your questions, or an eLearning solution at your convenience, SUSE has you covered with hands-on training, public online training, on-demand training and self-study kits. Btech Training for OpenStack is OpenStack extensive hands-on training tracks that designed for participants who are intending to prepare for COA exam, to begin implement OpenStack in production environment or to learn OpenStack deeper and integrate it with other open system. Training course locations are Jakarta & Bogor (Indonesia) or Inhouse (South East Asia). EasyStack offers a series of comprehensive OpenStack courses, enabling IT professionals to quickly master and adopt OpenStack technology for their modern enterprise applications' development. Through our courses, you'll learn how to design, build, administer, operate and develop OpenStack clouds. Courses offered range from real-world OpenStack fundamentals to a deep dive hands-on lab. EasyStack is a longtime Corporate Sponsor of the OpenStack Foundation who offers ESCloud, an enterprise cloud platform Powered by OpenStack, as one of its core products. Our hands-on, task-focused courses and certifications give IT teams the real-world skills they need. 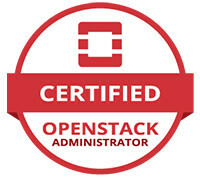 Our Red Hat OpenStack Administration course is available via classroom, virtual classroom, self-paced online, or private team training. With 20+ years experience in enterprise UNIX and open source systems Component Soft offers a growing family of OpenStack trainings in several European and North-American cities as well as online. In-depth coverage of the theory and hands-on exercises at affordable prices. Led by early adopters of OpenStack, Mirantis Training for OpenStack has trained over 10,000 students using an industry-recognized 100% pure OpenStack curriculum, with 95% of our students recommending our training. Public & private classes available.